As the leading independent supplier of soundproof rack enclosures, our objective is to make your life both easier and quieter! Quiet server racks and soundproof computer cabinets virtually eliminate the perception of loud server noise or dampen it down to an acceptable level. These quiet server racks come equipped with acoustic soundproofing foam and are manufactured to reduce server noise, while still removing heat generated by your IT equipment. The UCoustic™ 9210i EDGE series soundproof rack is a premium collection of quiet rack enclosures that provides the ultimate combination of noise reduction and air cooled thermal performance. The AcoustiQuiet™ series soundproof rack provides an economical alternative solution to providing network capacity to the working environment. 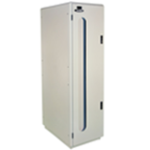 The AcoustiQuiet™ Mini cabinet offers sound reducing capability in a 9u or 12u sized enclosure. Ideal for storage under a workstation or where space may be limited. The UCoustic™ 7250 series soundproof wall mounted rack is a great alternative where space is a premium yet the desire for the ultimate combination of noise reduction and air cooled thermal performance remains. 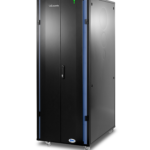 Not only are soundproof rack enclosures green, they make sense economically by saving you the money that would be spent on building and maintaining a dedicated server room. They improve your organizations' working environment by silencing noisy servers, routers, switches and computer noise. In today's business environment, many offices are fitted with an "open concept" layout to help maximize the flexibility and communication of the organization. A secure, mobile and quiet solution is required to integrate the company's network and communication equipment into these work spaces without the disruption of the noise found in most applications. Let us know how we can help. Contact us for more information about the variety of sound reducing cabinets available or for assistance in locating a dealer near you. Locate a dealer near you that is experienced in sizing the appropriate acoustic cabinet to meet your network demands.